Though not perhaps the outright class leader, the BMW 7 Series is a hugely impressive and capable luxury sedan. We may laud from time to time about how much variety there is in more mainstream car segments, but it’s also worth pointing out that there’s a surprising amount of choice available in the luxury sedan segment. Though the Mercedes-Benz S-Class and are probably the most obvious luxury sedan models on the market, this segment offers a fair amount of diversity, ranging from fresh-faced arrivals like the new second-generation Porsche Panamera to more established models like the Jaguar XJ and Maserati Quattroporte – along with the new BMW 7 Series we’re featuring in this review. As probably expected from a vehicle of this caliber, the BMW 7 Series is arguably a mighty fine vehicle that does its job as BMW’s flagship road car exceptionally well. So much so that, even though we don’t quite think it does as impeccable a job as the brilliant Mercedes-Benz S-Class, the BMW 7 Series is still a terrific road car that will satisfy anyone who can afford such an expensive machine. Beautifully made and very spacious. What more could you ask for? Objectively, we don’t think the BMW 7 Series has the best interior in this class. We’ll get this out of the way early on: objectively, we don’t think the BMW 7 Series has the best interior in this class. Unsurprisingly, we feel that particular gong belongs to the S-Class, primarily because it has a more premium-feeling cabin than the BMW 7 Series. That is genuinely a small margin, though: by all objective measures (and subjective measures, when you consider the Mercedes-Benz is nearly $15,000 more expensive than the BMW), the 7 Series is a lovely vehicle to spend time in. Overall quality, for instance, is top notch, with lots of high-end leathers, wood and metal trim pieces being used throughout the incredibly spacious cabin. And we do genuinely mean ‘incredibly spacious’: BMW is only offering the 7 Series in the US with the longer wheelbase that’s usually an option in other markets, so there’s acres of head and leg room on offer for the driver and passengers. Factor in the extremely comfortable and supportive seats, and you have yourself the makings of an exceptional sedan interior. Perhaps our most favorite part of the BMW 7 Series’ interior, though, is the new infotainment system. The trunk’s also, even by sedan standards, quite impressive. Though you can’t fold the rear seat backs down, the sizeable 18.2 cubic feet (the largest trunk you’ll find in this class, no less) is more than big enough to swallow up large items like suitcases and bags of golf clubs. Plus, as a result of the wide opening and the shallow-for-a-sedan trunk lip, it’s fairly straightforward to load larger and more cumbersome items in and out of the BMW 7 Series’ cargo area. Perhaps our most favorite part of the BMW 7 Series’ interior, though, is the new infotainment system that forms the proverbial cherry of the cabin. It’s still an iDrive system, but this refreshed setup that’s making its debut in the 7 Series is a notable improvement over what’s available in lesser BMWs, being even more streamlined and easy to navigate before, on top of the new touchscreen and hand gesture recognition input methods. For sure, the latter of those two features is a bit gimmicky, but it’s very clever nonetheless, and is a remarkable showcase of just how advanced some of the technology in the BMW 7 Series really is. Plus, the screen itself has a crisp and clear resolution, is of a good size at 10.3 inches and, as it’s placed right on the top of the dashboard, you don’t need to avert your gaze from the road ahead for too long in order to see what’s being shown on the touchscreen. The new 7 Series places a far greater emphasis this time around in catering to the demands of keeping its occupants. One of the few more notable complaints with the previous generation of BMW 7 Series was that it perhaps placed a bit too much of an emphasis on the driver rather than the passengers. For sure, the old 7 Series wasn’t uncomfortable, and there were no allusions to the BMW being as dynamic as a sports car, but there was no denying that the traditional elements that defined the driving characteristics of less prestigious BMWs probably weren’t quite as desirable in a market defined by more comfort-oriented cars. It seems BMW actually agreed with that sentiment, as the new 7 Series places a far greater emphasis this time around in catering to the demands of keeping its occupants cossetting and comfortable. Though the BMW 7 Series is still fairly responsive by class standards, it’s now far more at home cruising about on more open stretches of road. The standard-fit air suspension system, for instance, does a very good job of filtering out imperfections in the road surface (if though we’d prefer the 7 Series to cope with road fixtures like expansion joints more effectively), and the suppression of wind noise is particularly impressive. Sadly, there are some slight imperfections that do disappoint us a tad. For instance, though wind noise is very well controlled, the same can’t quite be said of tire roar, which is a bit too prominent in an $80,000+ luxury sedan for our liking, Likewise, those aforementioned jolts over road fixtures are a bit disappointing, considering the rest of the ride is so good everywhere else. It’s also worth pointing out that the BMW 7 Series also suffers from a few notable blind spots. Through the broad windshield means the view directly head isn’t really impeded, the pillars do hamper overall visibility somewhat. The center pillars that are roughly in line with the front seats are particularly obtrusive, and negatively affect over-the-shoulder visibility substantially. The base 3.0-liter turbocharged six-cylinder gasoline unit is the one to stick with. Normally, we’d recommend certain engines over others in the range, with a lot of that reasoning often being down to fuel consumption rates. However, as the cheapest BMW 7 Series you can by costs over $80,000, we doubt fuel economy is on the minds of most buyers, so – as all the engines available in the 7 Series are great – we’ll let you decide which one o go for based on your tastes. If you really want us to pick an engine for you, then we’d probably say the base 3.0-liter turbocharged six-cylinder gasoline unit is the one to stick with. Though it’s far from being the most powerful engine you can specify for your BMW 7 Series, the 3.0-liter’s 320-hp and 332 lb-ft outputs (the latter being available across most of the rev range, ensuring the car has plenty of pulling power on tap) are still more than capable enough to lug about the BMW 7 Series’ sheer bulk. Plus, it’s surprisingly efficient, with BMW claiming it’s possible to return 21mpg in the city and 29mpg on the highway in a rear-wheel drive 3.0-liter BMW 7 Series, and 19mpg in the city and 28mpg on the highway on all-wheel drive versions. For reference, the similarly potent gasoline-electric hybrid powertrain returns 22mpg and 32mpg during urban and freeway excursions respectively – which isn’t that massive a margin, considering the hybrid’s positioning as the de-facto choice for wealthy car buyers who want their luxury sedans to be extremely efficient. And if that’s not enough for you, there’s also a twin-turbocharged, 6.6-liter twelve-cylinder gasoline engine. 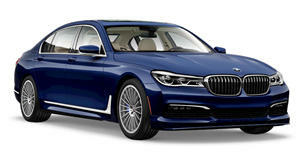 For those who’d rather sacrifice a few miles per gallon in favour of brute force, then the 4.4-liter twin-turbocharged eight-cylinder gasoline engine will likely be the preferred option, with the 445-hp and 479 lb-ft it generates putting the BMW 7 Series on par performance-wise with many sports cars. And if that’s not enough for you, there’s also a twin-turbocharged, 6.6-liter twelve-cylinder gasoline engine with 610-hp and 590 lb-ft in the flagship BMW 7 Series, for those who are willing to spend well over $100,000 on a ludicrously quick luxury limo. Regardless of which engine you specify in your BMW 7 Series, you’ll have a beautifully smooth and refined powertrain at your disposal, with linear power deliveries and oodles of torque from low-down in the rev range. As a result, even in the least powerful options, you’ll never need to work the engines too hard in order to get them up to speed. Better still is the eight-speed automatic transmission. Regardless of whether you change gears yourself using the paddles mounted behind the steering wheel, or let the gearbox sort itself out independently, the gear changes themselves are smooth, slick and nigh-on instantaneous, and the transmission does such a good job at selecting the right gear that you never really need to manually override the system. The abundance of ratios and quick gear shifts also feeds back into the refined, punchy-from-low-down qualities of the engines. With eight forward speeds to choose from and quick, snappy shifts, the engine should remain for at least a considerable majority of the time right in the optimum rev band for whatever your driving temperament at the time is. Put simply, it’s a great transmission that suits the car exceptionally well. The BMW 7 Series comes with a whole host of extra enticing goodies. Being the range-topper of the BMW range, the BMW 7 Series unsurprisingly comes loaded with equipment. On top of the fancy new iDrive system and the gesture controls we discussed earlier, the BMW 7 Series comes with a whole host of extra enticing goodies like four-zone climate control, built-in navigation, power-adjustment for the front seats and steering wheel, all-round parking sensors, heated seats, and a wireless charging functionality. If those features aren’t quite enough for you, then there are some optional extras to choose from (as probably expected, considering every other BMW has an incredibly diverse options list nowadays). Our personal picks would be the two Driver Assistance packages, which include a vast array of safety gear like lane departure warning, blind spot monitoring, adaptive cruise control that can control the gear to and from standstills, an autonomous braking system that can slow the car down if it detects an obstruction ahead, and even a system that’ll park the car for you as long as you select the appropriate gear. At a combined price of $3,600, such equipment isn’t expensive to buy, but they’re reasonable enough considering the kind of person who can afford a BMW 7 Series will likely have enough in the bank to fork out that much on optional equipment. The BMW 7 Series comes with a four-years/50.000-miles bumper-to-bumper new car warranty. Other items, though particularly pleasant, are harder to justify recommending: the Luxury Seating Package may be appealing, via its heated front seats and massage functionality for the rear seats, but it is considerably pricey at $3,900, and it’s a great shame that the head-up display and ventilation functionality for the front seats have been cordoned off into the $4,100 Executive Package. Perhaps our biggest criticism (which, to be fair, is quite out of the BMW 7 Series’ control) is the fact residual values aren’t particularly strong for luxury sedans – meaning, regardless of how much money you throw at the vehicle, you’ll likely not recoup that much back by the time you sell the car on. Still, at least reliability shouldn’t be a big concern, as the BMW 7 Series comes with a four-years/50.000-miles bumper-to-bumper new car warranty.